Hobbies: Reading, a long bath in lukewarm water, and testing out health and beauty remedies on other people. After he's worked quite a bit, he prefers spending time to gather himself alone. Favourite Colour: Shades of green. He's a man who's fine with putting green and pink together. Favourite Foods and Drinks: No real likes or dislikes, but prefers Japanese food and sake. Hated Foods: He will refuse strange foods with a smile. Special Talents: Driving technique, skill with his chi, general household chores, consideration, and painting pictures (though he gets engrossed in drawing ominous designs that are reminiscent of horror movies). Despite his pleasant and calm outward expression, Hakkai is a demon not to be reckoned with. He is capable of channeling his chi into powerful bursts of energy in battle, and can also form it into a shield to protect himself or his friends. He wears three ear cuffs that act as his limiters. When removed, his true power is released. He can often dispatch demons much larger than himself or numerous foes in this form. Hakkai is often reluctant to do so due to the possible danger to his friends. Out of Sanzo's companions, as well as Sanzo himself, Hakkai is the one who takes care of most of the group's basic tasks: cleaning up after them, shopping, cooking, etc. The jeep Hakkai drives is actually his small magical dragon companion, Hakuryuu. Long before the journey to the west, Hakkai was known as the human Cho Gonou, an orphan who later met and mutually fell in love with his twin sister, Cho Kanan. He was a teacher in the village that they later lived in together. One day Gonou returned from work to find that the townspeople had given Kanan as an offering to the centipede demon Hyakuganmaou. From their perspective, she was "the most expendable of the women", as she had no family other than Gonou. Enraged, Gonou slaughtered a large number of townsfolk before journeying to the demon's castle. There, he killed every demon he found single-handedly. Upon finding the imprisoned Kanan, he wanted to free her and take her home with him. She refused. Having been unwillingly impregnated by the demon king, she stole and used Gonou's blade to she killed herself in front of him. The distraught Cho Gonou was found by the remaining son of Hyakuganmaou, Chin Yisou, who attacked him, slicing his belly. Wanting to find out whether or not a tale that he'd heard was true, Chin Yisou dripped his own blood into Gonou's wound. Having now bathed in the blood of 1,000 demons, Gonou turned into one himself, killing Yisou before leaving the castle. The wounded Cho Gonou was saved physically by the half-demon Sha Gojyo and spiritually by Genjou Sanzo. As a symbol of his rebirn, he took on the name of Cho Hakkai. He and Gojyo became very good friends and roommates due to their experiences together before the journey to the West. Hakkai often still reflects on his past pain, and his memories of Kanan are bittersweet. In his previous life, Hakkai was a god known as Field Marshal Tenpou, an eccentric military man who was fond of his library of books, many of which were about the world below. He could often be found with his nose in a book (or buried under them) in his library. 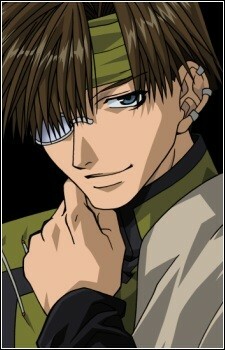 He was close friends with his subordinate General Kenren, as well as Konzen Douji. He and Kenren were fairly inseparable and had an easy-going relationship despite their difference in rank. Although Tenpou tended to be mild-mannered, when provoked he was not to be taken lightly and would fiercely defend those he cared about, qualities that he carried over into his next life. Tenpou's weapon of choice was the katana.